Try this delicious treat at home! Matzo, not the most appetizing of foods, but traditional Jewish foods really aren’t all that. This I know, there is only so much potato kugel and gefilte fish they could serve me when I was a kid before I was on to it. The one thing I do still love are coconut macaroons, I have to restrain myself when they come back on the shelves this time of year because I can eat a whole tin! Kelapo Coconut Oil happens to be a perfect compliment to Passover foods because it can be used in place of butter when making a kosher meat-based meal. For this Passover, I am using Kelapo coconut oil with whole wheat matzo as a substitution in a springtime dish. 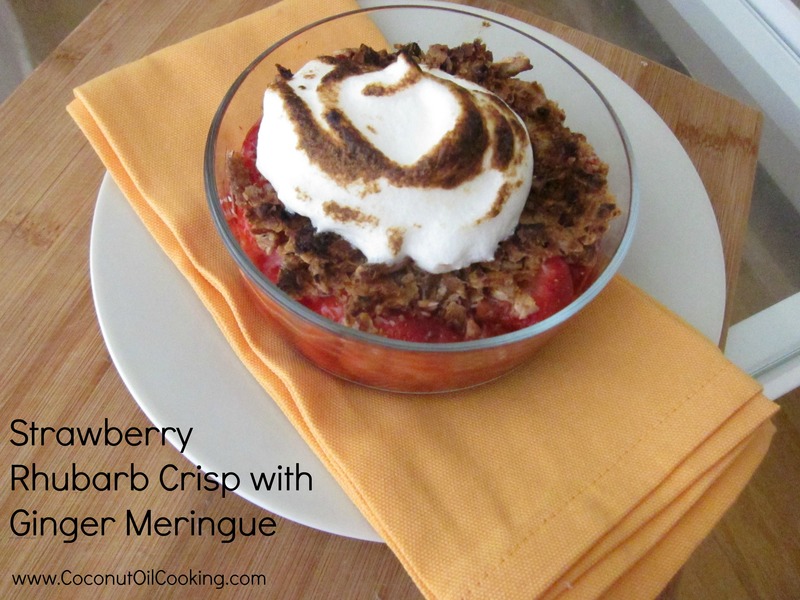 This Strawberry-Rhubarb Crisp is a wonderful tangy-sweet combination; and dressed up with this surprisingly easy ooey-gooey ginger meringue, it’s a delight to that beige assortment of Passover foods. This dish serves six to eight people and is perfect, not only for Passover, but anytime you want a delicious and light dessert. 2. For the fruit, toss the rhubarb, strawberries, 3/4 cup of the sugar and the orange zest together in a large bowl. In a measuring cup, dissolve the arrowroot in the orange juice and then mix it into the fruit. Pour the mixture into an 8-by-11-inch baking dish and place it on a sheet pan lined with parchment paper. 3. For the topping combine the crushed matzo with the coconut, sugar and salt. Add in the coconut oil to coat and create coarse crumbles. Scatter evenly over the fruit mixture and bake for 1 hour. 1. Combine sugar, water and ginger in a small saucepan; stir to coat sugar with water. Keep a pastry brush in a bowl of water to brush onto sides of pot to prevent sugar burning on the sides and crystallizing the syrup. Cook over medium-high heat, brushing the sides occasionally. Place a candy thermometer into the pot and cook until it reaches between 235–242° (soft ball stage). 2. Meanwhile, place egg whites in the bowl of an electric mixer on low speed until foamy. Add the cream of tartar and increase speed to medium; continue until soft peaks form. With mixer spinning, pour in hot syrup in a slow, thin stream (remove ginger with a spoon before pouring). Beat until meringue is stiff and glossy. 3. 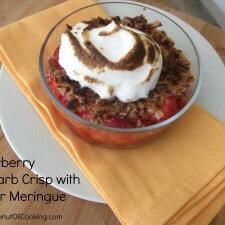 Spoon meringue onto the warm crisp; optionally, use a crème brulee torch to lightly toast the meringue before serving.